Melt the jaggery with 1/3 cup water, once melted filter and again boil it. When it foams and gets thick syrup consistency as shown in video remove from flame. In another pan melt ghee, add the broken wheat. Saute for a minute and then add khoya / mawa and paneer or ricotta cheese. It turns soft and add cardamom powder and baking powder. Now add filtered jaggery syrup. Cook until all the moisture evaporates and the burfi mixture turns to a rolling non sticky texture. I didn't use non sticky pan, still it won't stick much in ordinary pan as shown in video. 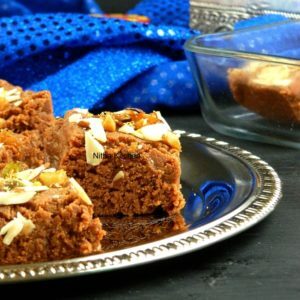 In a greased glass bowl or plate or in parchment paper add the burfi mixture. Level it add the chopped/ silvered nuts, press them so that it sticks on the burfi. When they are cooled completely slice them in to pieces. I got 9 pieces as shown in the pictures. When you are using store bought hard grated paneer and frozen mawa do add few tbsps of milk. In any case the mawa looks dry and hard, not leaving moisture do add few tbsps of milk. Also I have mentioned medium sweetness, you can adjust the taste at the end by adding regular sugar too. Instead of cardamom you can add any artificial flavor too. The same day I refrigerated for future use. You can freeze it in a well wrapped container too.